PHUKET: The arrival of police in numbers prevented a confrontation between workers and sea gypsies in Rawai from escalating into serious violence yesterday (May 25). 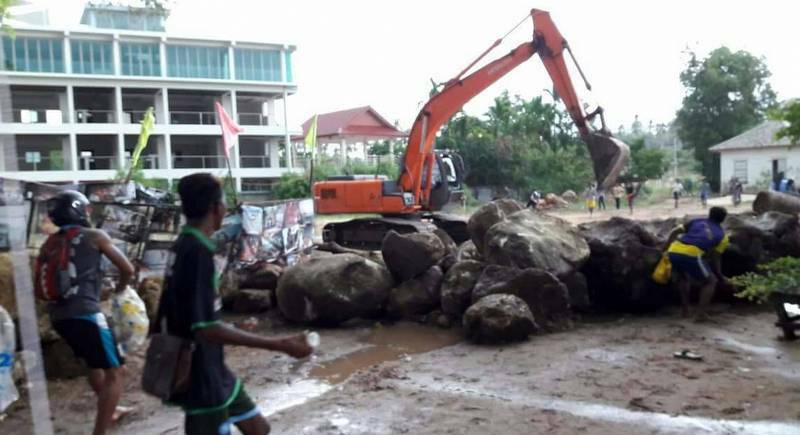 Residents in the area said that about 50 workers arrived with a backhoe at about 1pm and began moving boulders into place to block access to the sea gypsies sacred Balai shrine. In response, more than 200 sea gypsy villagers then arrived to stop the men from working. Both parties argued and threw rocks at each other for 30 minutes, then stopped just when Chalong Police Chief Col Nopadon Thiraprawat arrived with more than 50 officers and officials from Rawai Municipality to prevent the dispute from escalating into violence. While police were trying to talk both parties to cease hostilities, sea gypsies removed the large rocks out of the disputed area and cleared their walkway to the shrine. “The windows on the company’s backhoe were damaged and four workers and one sea gypsy left with minor injuries from the confrontation,” Col Nopadon said. “The situation abated when we arrived. Workers left the area, but they left the backhoe behind while some sea gypsies stayed to guard the site. We have officers monitoring the situation and provide them security. “We later contacted the company to remove their equipment from the area. Officials will have a yet another meeting soon to talk to both parties and resolve this,” he said. @ Christy Sweet, Nice you are a horse expert. I do horse riding myself ( not in Thailand). Yes, I really ment .." pulling a dead horse". That is the expression (translated in English) we use where I came from. Kurt, I'm a horse expert and I'm sure you meant the expression 'beating a dead horse,' not pulling it- although both are certainly futile, much as the campaign of the Sea Gypsies' to  retain land they squatted on some years past. Why does everybody glorify those so called sea gypsy's? they could get jobs at this projects and could stop illegal fishing like taking coral reef fish from Similan to sell in Singapore and so    on.But off course this means working! Thank you Kurt, for your lucid and concise summing-up of the situation. Who ever they are in this long going on dispute, it seems that in Land of Smile the thai people looks for confrontations day in, day out, sue each other in courts. Etc. When start this Baron company to be so wise to wait until the juridical process has finally gone through Courts? Every time this baron Company stirs up trouble at that location.